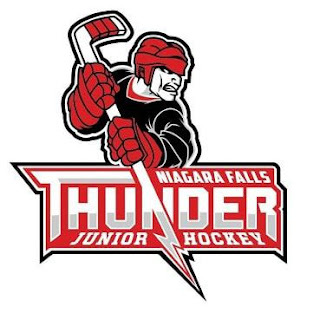 The Niagara Falls Thunder were swept in their first homestand of the USPHL hockey season Saturday evening after a 5-1 loss to the Connecticut Nighthawks. The Thunder was outshot 45-28 in the contest. Denis Kuzminov opened the scoring for Connecticut 3:35 into the first period. Austin Marini was credited with the lone assist. The Nighthawks doubled their lead with 7:40 left in the frame when Matthew Loftus found the back of the net. Andrew Miller assisted. Connecticut continued with their scoring touch in the second period as they extended their lead to 3-0. Shea Flanagan struck 11:28 into the frame with Jake Bojarzin picking up the assist. The Thunder found their way to the scoreboard on Tristan Englehardt’s goal with 3 seconds left in the period. Tristan Mock picked up the assist on the play. In the third period, Darwin Anderson nabbed a goal for the Nighthawks 9:03 in. He was assisted by Loftus and Miller. Connecticut capped the scoring for the evening with a powerplay marker by Marini with 79 seconds left in the game. Flanagan and Kuzminov assisted. Matthew Radder made 27 saves on 28 shot in the win for the Nighthawks. Ryan Pascarella turned away 40 of 45 for the Thunder. The Thunder’s next games will be a series of four games in the Northern Cyclones Showcase in Hudson, New Hampshire. Their next games at the Hyde Park Ice Pavilion in Niagara Falls will be October 13th and 14 against the Skipjacks Hockey Club. The Skipjacks will be traveling from York, Pennsylvania. 1st Period-1, Connecticut Nighthawks, Kuzminov 7 (Marini), 3:35. 2, Connecticut Nighthawks, Loftus 1 (Miller), 12:20. Penalties-Ienco Nft (roughing), 3:35; Miller Cnh (boarding), 8:51; Fongemie Cnh (hooking), 16:17. 3rd Period-5, Connecticut Nighthawks, Anderson 2 (Loftus, Miller), 9:03. 6, Connecticut Nighthawks, Marini 6 (Flanagan, Kuzminov), 18:41 (PP). Penalties-Marini Cnh (roughing), 3:24; Faliero Nft (interference), 17:58. Shots on Goal-Connecticut Nighthawks 16-13-16-45. Niagara Falls Thunder 8-13-7-28. Goalies-Connecticut Nighthawks, Radder 4-0-0-0 (28 shots-27 saves). Niagara Falls Thunder, Pascarella 1-2-0-0 (45 shots-40 saves).